One of the most glorious months of the year in my opinion. If you're having trouble embracing it, maybe these goodies will help. 1. Pink skinnies from H&M - threads for February. 2. Oversized purple sweater from H&M - threads for February. 3. Wildflowers - for this wild girl. 4. 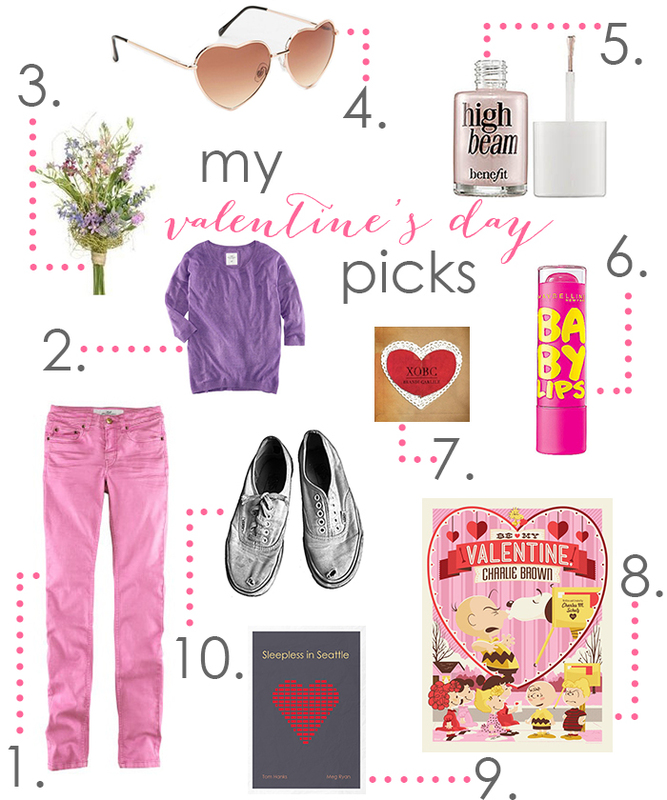 Heart-shaped sunnies from UO - threads for February. 5. High Beam by Benefit Cosmetics - easy-to-use highlighter. 6. Baby Lips by Maybelline New York - a must for this girl! 7. XOBC- Brandi Carlile's Heaven - love tunes. 8. Be My Valentine Charlie Brown - classic Valentine's Day movie. 9. Sleepless in Seattle - Nora Ephron's classic Valentine's Day movie. 10. Van's classic white lace-ups - always a good choice.